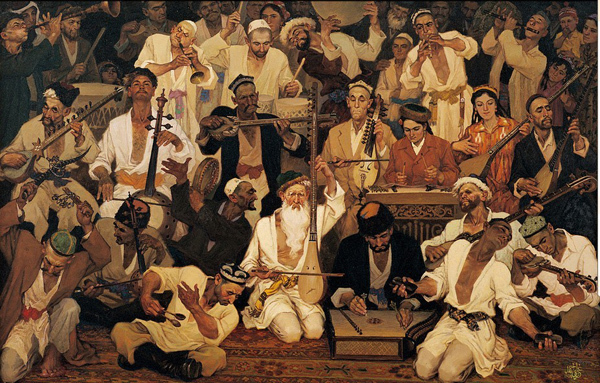 The On-Ikki Muqam (The 12 Muqam) are a set of musical suites which the Uyghurs trace in their present form back to the sixteenth century and the court of the Yarkand Khanate, though they also claim continuity with roots of considerable antiquity.The lyrics of the Twelve Muqam are drawn in part from the great Central Asian poets who wrote in the literary Turkic language, Chagatay: Shah Meshrep, Howayda and Nawayi. They also draw on epics like the tale of the lovers Gharip and Senam, and popular folk lyrics. The 12 volume set of books contain the musical transcriptions of all the 12 muqams and the song texts (in Uyghur and Chinese). These books are somewhat difficult to find nowadays but there are a couple of complete sets still available.